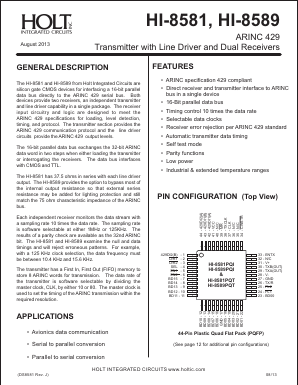 The HI-8581 and HI-8589 from Holt Integrated Circuits are silicon gate CMOS devices for interfacing a 16-bit parallel data bus directly to the ARINC 429 serial bus. Both devices provide two receivers, an independent transmitter and line driver capability in a single package. The receiver input circuitry and logic are designed to meet the ARINC 429 specifications for loading, level detection, timing, and protocol. The transmitter section provides the ARINC 429 communication protocol and the line driver circuits provide the ARINC 429 output levels. The HI-8581 has 37.5 ohms in series with each line driver output. The HI-8589 provides the option to bypass most of the internal output resistance so that external series resistance may be added for lighting protection and still match the 75 ohm characteristic impedance of the ARINC bus.